We issue a Certificate of Authenticity with all originals and limited edition prints. 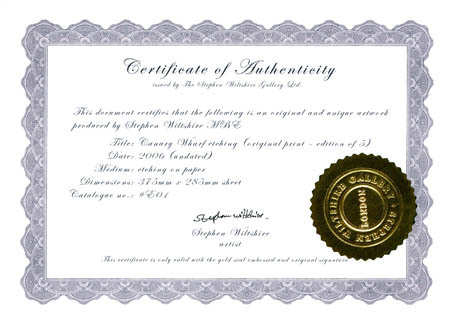 This document certifies that the artwork you purchase is a unique and original work or a limited edition series hand signed and numbered by Stephen Wiltshire MBE. The document describes the artwork, title, date, medium, size and a unique catalogue number along with Stephen Wiltshire's original signature. The Certificate is also marked with the official embossed stamp of The Stephen Wiltshire Gallery. As with all works of art, copyright remains with the artist. The purchaser is granted possession of the work, but permission must be sought for any reproduction rights from the artist’s agents, The Stephen Wiltshire Gallery Ltd., and a further fee may be negotiable, depending on the nature of the request. Commercial exploitation is not permitted without the granting of a licence and the payment of a fee. It is possible that in the future the artist’s agents may approach the purchaser requesting short term loan of the work, for example for exhibition purposes, and it is hoped that the purchaser will approve and comply with such a request. If anytime in the future the owner wishes to sell the work, it would be greatly appreciated if the artist’s agents were given first offer to purchase. Please note it may take up to 3 weeks to mail your certificate to you from the date of purchase.